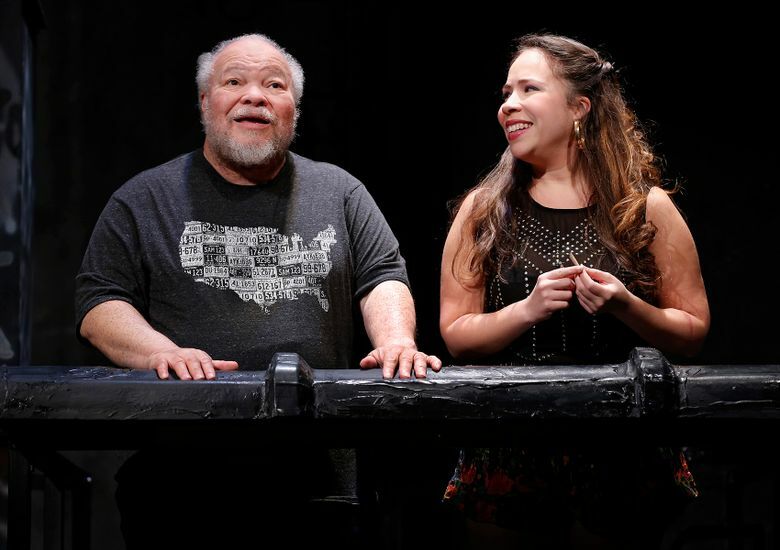 Short reviews of “Between Riverside and Crazy” at Second Stage Theatre; “Constellations” at Samuel J. Friedman Theater; and “Honeymoon in Vegas” at the Nederlander. In the relative lull before spring’s avalanche of Broadway openings (timed to make the deadline for 2015 Tony Award consideration) several new productions around Times Square — two plays and a splashy musical — piqued my attention on a recent New York City jaunt. For show information and tickets, go to broadway.com. Seattle producers have yet to pick up on the critically lauded scripts of Stephen Adly Guirgis. Maybe because his pungent blend of gritty humor and poetic realism springs from a very specific milieu of black and Latino working-class New Yorkers? But attention should be paid to this extraordinary playwright, and particularly to his most recent and most accomplished play to date, “Between Riverside and Crazy,” a 2014 hit now having an extended run Off Broadway at Second Stage. Endowed with cantankerous gravitas by the terrific actor and August Wilson favorite Stephen M. Henderson, Walter “Pops” Washington is a retired African-American cop and an immovable force. He refuses to be evicted from his longtime home, an unkempt, rent-controlled Upper West Side flat now worth a fortune to its owners. He plays hardball with his ex-colleagues at the NYPD over a murky, race-tinged injury claim they desperately want to settle. Beneath the gruffness, profanity and nasty streak, Walter is a father figure, and this is a play in the ongoing tradition of American family dramas, complex, funny and heart-rending. In his own paradoxical fashion, Walter tries to straighten out his dealer son Junior and Junior’s dizzy young girlfriend, and be a surrogate dad to a puppyish recovering drug addict who can scarily flip into beast mode. Guirgis has a great ear for dialogue, and his street-wise, Mamet/Wilson-esque patois fairly sings. The engaging Riverside Drive scammers and dreamers he conjures are of an ilk rarely seen (or portrayed well) on Seattle stages, and they are drawn with pitiless candor and affection. Even when they disappoint themselves and each other, Guirgis never writes them off — nor could I. This is the latest test case of whether a movie star and stage novice (Jake Gyllenhaal) can go toe-to-toe on Broadway with a savvy stage veteran (versatile Ruth Wilson, a Golden Globe winner for Showtime’s “The Affair”). Gyllenhaal doesn’t in the least embarrass himself in Nick Payne’s two-character love story, set in Wilson’s native England. And these actors share a palpable rapport throughout the hourlong one-act, which spins on two popular tropes: the roads taken/not taken premise, and quantum physics as metaphor and comfort zone. Wilson charms as Marianne, a brainy, socially awkward theoretical cosmologist. (Is there any other kind?) She and Gyllenhaal’s shy beekeeper Roland meet at a party, and do/don’t/maybe couple and marry. Encounters defining their relationship are re-enacted multiple times, each with a different slant or outcome. 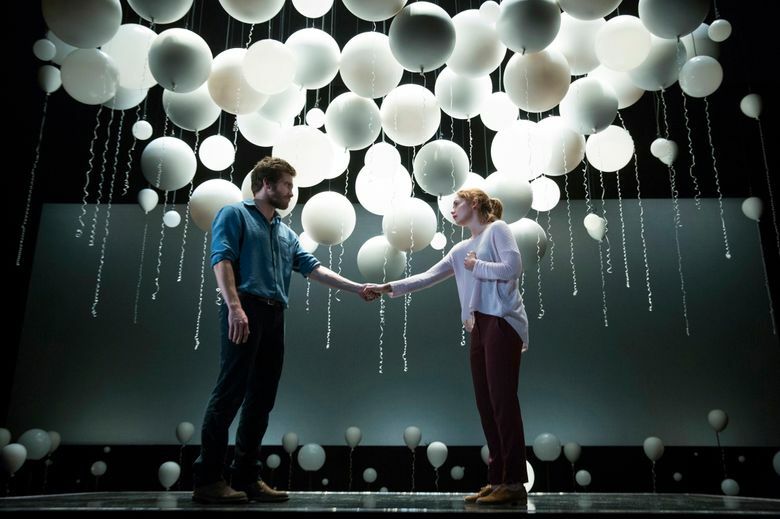 On a single set cunningly adorned with helium balloons and starry galaxies, the actors must make their transformations and changes of heart swift and persuasive. That they do, as Marianne and Roland cycle through stages of intimacy, estrangement, and wrenching loss. With humor and a touch of manipulative pathos, “Constellations” delves into the uncertainty of what we want or expect from a partner, in a post-Einstein era governed not by destiny, but relativity. The play has been critically lauded on both sides of the Atlantic, and will likely get produced, well, everywhere. But as I watched, I admired the intelligence but never transcended my awareness of the script as a structural and cosmological exercise in itself. That distanced me from the couple’s individual humanity. I guess I got lost in the stars. This is the sort of splashy, friendly, laugh-aloud musical comedy Broadway audiences have been hungering for in a season that, so far, has lacked one. Or is it? A very polished, unapologetic throwback (or, as I like to call it, retro-with-cellphones), “Honeymoon in Vegas” is closely based on the so-so 1992 movie romp of the same title. Like the film, the musical nostalgically embraces such old Vegas standbys as a debonair high-rolling gambler, leggy chorines, a gaudy platoon of Elvis impersonators, all romping to a jazzy Sinatra-style big-band score. The latter was created with panache by composer-lyricistJason Robert Brown,and the book’s by the movie’s director-writer, Andrew Bergman. All that ring-a-ding stuff garnishes an affably silly, shtick-laden farce about a gullible guy and his increasingly impatient bride-to-be. You can readily imagine Jerry Lewis as Jack, the likable schmo who aims to defy his mother’s deathbed curse forbidding him to wed, only to entirely blow his wedding night at the poker table. There a suave cardsharp (a surprisingly cool Tony Danza) relieves Jack of his cash, and his fiancée. Of course, Lewis doesn’t star here. The role is occupied by Rob McClure — a singing-pratfalling dynamo nearly as antic as the Jer, but a lot easier on the nerves. McClure et al pour on the brio in “Honeymoon in Vegas,” reviving those Sin City clichés with gusto. Yet despite good reviews and ready charms, the show is lagging at the box office — maybe because it’s not a film everyone knows, or because there’s no Hollywood star on the marquee.